The progress across Billionaire’s Row has been significant in recent months. 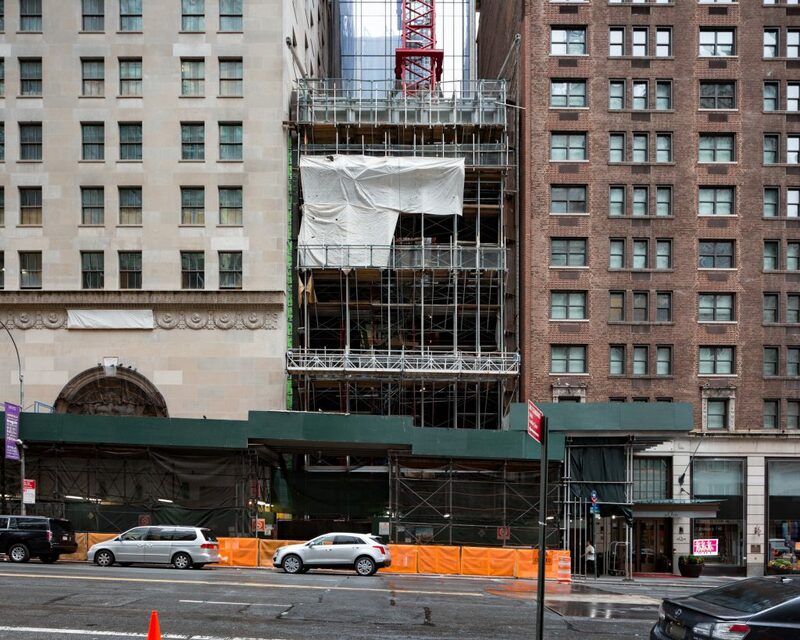 Today, YIMBY has an update on Midtown’s new terracotta masterpiece, for which sales are starting, and the latest photographs show that construction has officially reached supertall heights. JDS Development and Property Markets Group are behind the project. 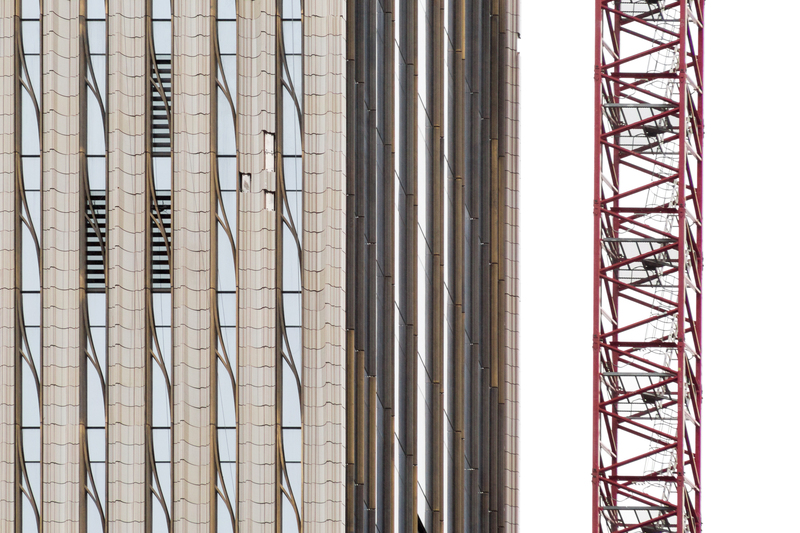 Photographs from this dreary week show the tower has passed its third setback, pushing it past the 984-foot tall threshold for supertall status. 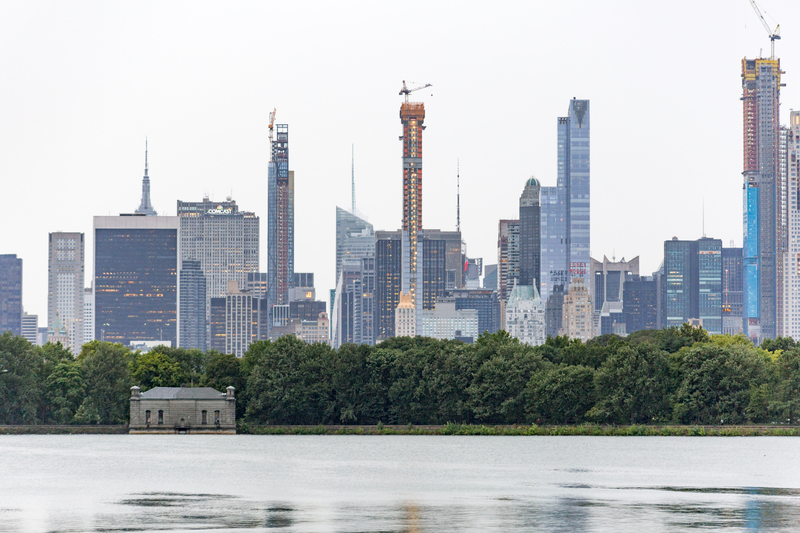 With this milestone now reached, the superstructure is just under 70 percent complete, and 440 feet are left before topping out occurs 1,428 feet above street level. Nine more setbacks remain before reaching the topmost steel truss cap. SHoP Architects is responsible for the design. The exterior has a light blue curtain wall along the northern and southern faces, with the west and east facades decorated with a bronze and terracotta shaped deliberately to interact with the sun, creating a sweeping effect in direct sunlight. The terracotta is currently reaching the first setback, over halfway up the tower. A total of 60 condominiums will be created within. 46 residencies will be in the tower, and the remaining fourteen will be located inside the existing historic Steinway building at the base. Construction is currently underway on the 57th Street atrium. 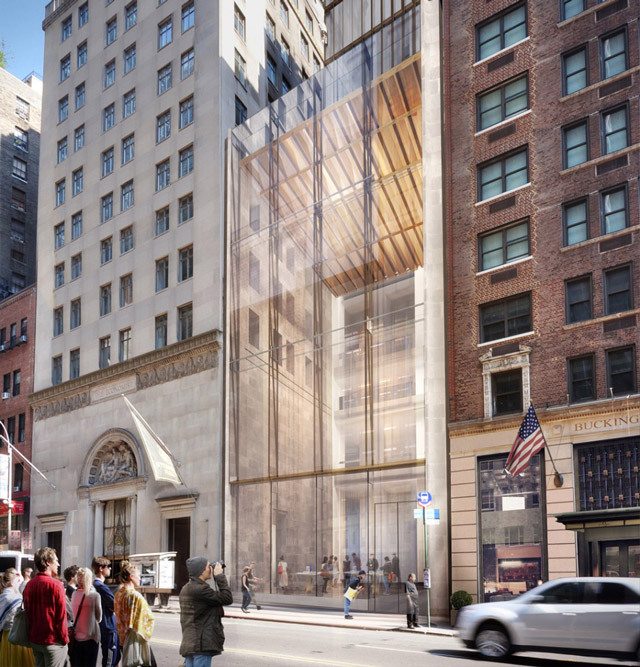 The highly transparent façade was designed to maximize views of the historic Steinway Building from the street as well as interior natural lighting. According to the New York Times, units start at $18 million, with the most expensive listing priced at $57 million for a duplex penthouse. The penthouse had been priced before at $59 million. Douglas Elliman Development Marketing is responsible for sales, which will start September 13th. Completion can be expected by 2019, when the developers hope to start occupancy. 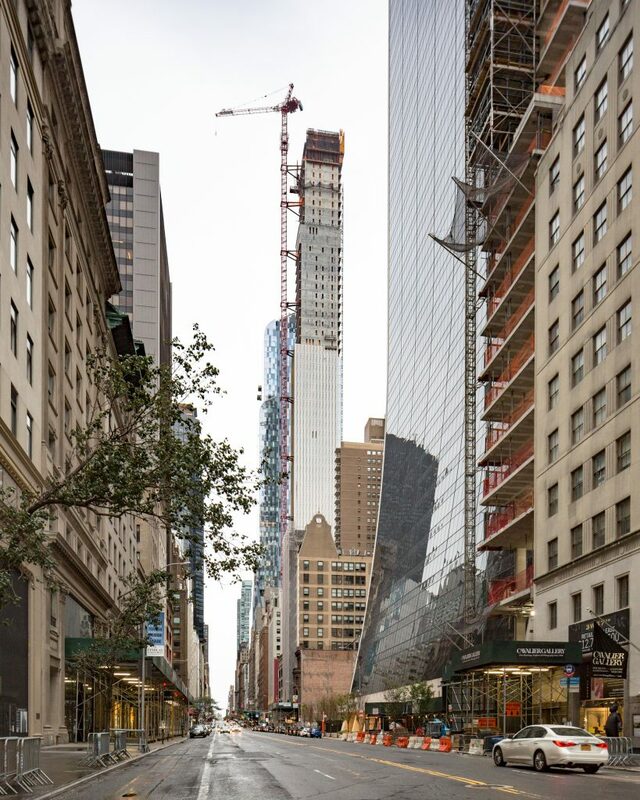 27 Comments on "111 West 57th Street Reaches Supertall Heights as Pieces of the Façade Appear to Go Missing"
The pieces may also have been intentionally removed after someone noticed they were defective in some way. If they had fallen off it probably would have made the news. Please pardon me for using your space: Small spot damage so bigger with its beautiful terracotta. Drink for design. How dare you make light of this stunning achievement for the ages –which will give the ultra-rich yet another sky platform from which to “trickle-down” on the rest of us. I grant you that the facade does look a bit tacky however. Let’s hope it was not manufactured by the same cabal that worked on that infamous London tower facade. The absence of cladding panels does not necessarily indicate “pieces of the facade are falling off”. There are many reasons why panels may be missing. It is an irresponsible to claim to make without further evidence to back it up. Let’s hope they glue it all back together before the next hurricane. 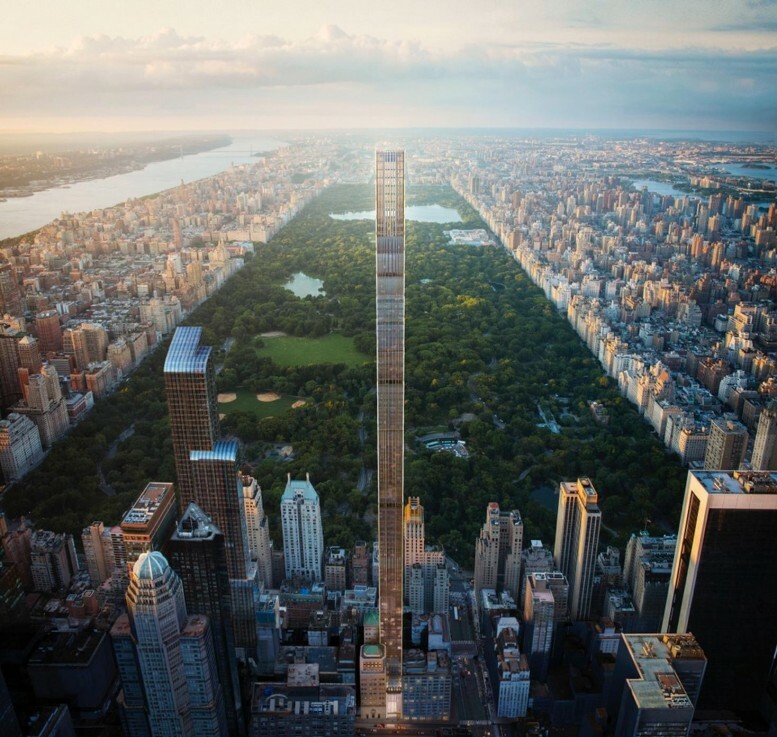 I remember the last 57th street super-tall difficulties during Sandy. 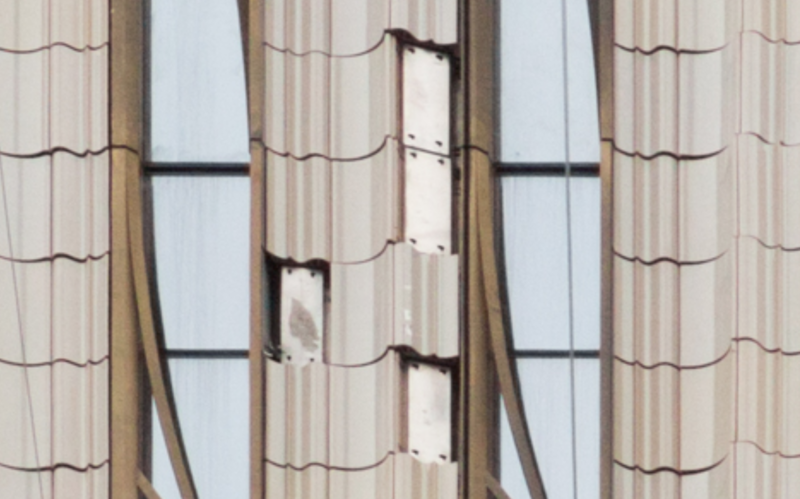 As noted in the article, the missing pieces of cladding panels are strategically located to accommodate the anchoring of mounting brackets necessary for rigging removal. Then they’ll be placed. Of interest to me is whether the diagonal fenestra elements will obstruct the views from inside the units. In fairness, most all cladding jobs in buildings under construction have their gaps and imperfections that eventually get cleaned up. Funny how no one brings up Central Park Tower (a Union built job) losing a window which fell killing one worker and injuring another earlier this year. the “morons” they hired are in the top 10 in USglass and are capable of much more…..you’re a joke, sir. You are a very good speculator and have a wonderful imagination,but very far from the truth!! I wouldn’t walk on the sidewalk under that facade ever. I am sure they will be falling for years. Safer than union job that’s one block away. who is the installer anyways? and who’s products? The Terracotta Panels are different, slightly in color, and they change dimensions at the edge every other piece. This is supposed to have a shimmy effect and it does have a slight one. The ones missing were either damaged during transport or during install. If the same type of terracotta is unavailable to borrow from other IGU units in stock on the floors before installation, they will leave it out and go back later when they have new pieces from Germany where they are made. This Punchlist by Jangho, (who ELICC really is) will go on for the next 6 years. Terrible quality on this building, but what do you expect when the bronze and glass are from China, assembled in Mexico, brought over the border, then shipped from California, and put up by 20 dollar an hour laborers, not glaziers or experienced men. 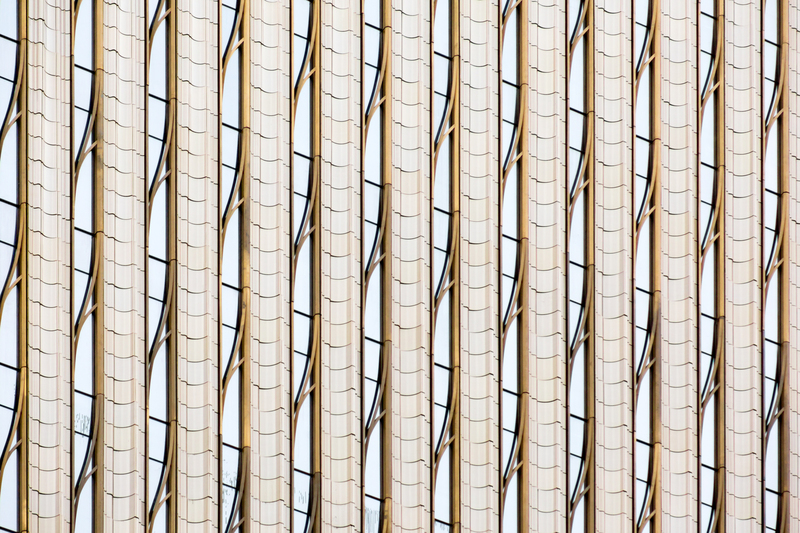 Ten floors of curtain wall were not aligned and unlevel, it was left that way to appease JDS. Gutters on the shear walls not installed properly, pieces missing. Look at JDS other building (Copper Building) done by the same crew, where the BMU tracks for the window washing equipment were installed not in vertical alignment. This ELICC? Jangho company is cheap, JDS wants then for the Brooklyn Supertall as well, wait until the tenants start feeling the drafts, and water creeping in where gaskets were forgotten or left out, the place is a mess , not worth the millions people will pay, resale value is a joke. The supports for the monorail are on the upper floors, and come through the windows, not the Terracotta. Why has not one single panel been installed since July on this building? Bigger problems than missing terracotta, another ELICC/ Jangho disaster just like Philadelphia Comcast, they will probably pull off this one also. Are you mad bro?Maybe your not working.Stop posting lies.You are just upset because you know that all of New York is going nonunion and I know for a fact that 80 panels were set last week,you putz! Thank you for setting the record straight. TERRA COTTA IS NOT FALLING OFF THE BUILDING. Alot has changed since you left, skilled glaziers were hired and it is NOT the same “crew” from the “copper building” maybe you should get off your high horse, get a job and stop stalking the job like the petty rat you are.